Dan Meyer swallows a sword underwater in a tank of sharks and stingrays as a stingray brushes by at the Ripleys Aquarium Myrtle Beach. 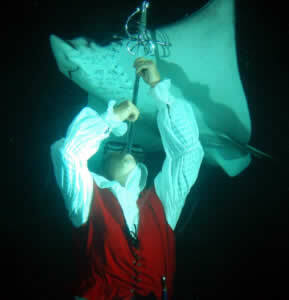 MYRTLE BEACH, South Carolina -- On Friday, May 18, 2007, sword swallower Dan Meyer made history by being the first person in America to swallow a solid steel sword while submerged underwater in a tank of live sharks and stingrays at Ripley's Aquarium in Myrtle Beach, SC. Sponsored by Ripley's Believe It or Not, the underwater event was designed to promote Ripley's Aquarium's "Pirates, Predators of the Sea" exhibit that educates visitors on the history of pirates, many of which frequented the Myrtle Beach area. The event occurred during Myrtle Beach's "Bike Week" which was also set around the pirate theme "Cruisin' the Coast", drawing over 300,000 motorcycle enthusiasts from around the world May 11-20. "We wanted to present an event to amaze and entertain Bike Week visitors while promoting our "Pirates" exhibit and making a connection between pirates and the undersea world," explained Ripley Entertainment VP Tim O'Brien. "Having a swashbuckling pirate like 'Captain Cutless' swallow a sword underwater was the perfect fit!" "Captain Cutless", better known as Dan Meyer, is a professional sword swallower from Nashville, TN who has been featured in numerous documentaries, articles and medical studies for swallowing swords around the world. As the Executive Director of the Sword Swallowers Association International, Meyer is widely recognized as one of the foremost authorities in the world on the ancient art of sword swallowing. To stretch the boundaries of the art, Meyer swallowed a 30-inch long solid steel sword while submerged 15 feet underwater surrounded by more than 80 sharks and stingrays in 85,000 gallons of salt water. Of course, there are the obvious dangers in attempting a feat like this -- Sword swallowing can cause serious injury and even death. "Swallowing a solid steel sword is incredibly dangerous enough as it is on dry land," Meyer explains. "Last year while swallowing five swords at once, I ended up in the hospital with a serious injury that almost killed me - a punctured stomach that caused pleurisy and fluid around my heart and lungs. The pain was incredible, and I couldn't swallow solid food for several weeks!" he recounted. This time the dangers were multiplied with additional challenges besides the obvious risks of cuts, punctures and perforations. "The worst injuries occur when trying to swallow a sword when the throat is tender and swollen. I was really worried because I've had a 'sword throat' with swelling that had me really concerned and almost made me call it off this morning." Meyer said. "Then when I got in the tank, it was much more difficult to lean my head back and open my mouth fifteen feet underwater and surrounded by 85,000 gallons of salt water. When I opened my mouth to swallow the sword, the air rushed up out of my lungs. Not only did I have to focus on swallowing the sword correctly without impaling myself, but I had to contend with the sharks and stingrays not bumping into me while concentrating on not drowning," Meyer explained. "…And to top it all off, I managed to do it within 29 minutes after eating a full meal!" The historic feat occurred on Friday, May 18th at the Ripley's Aquarium Myrtle Beach in the 85,000 gallon "Ray Bay" exhibit that is home to over 80 sharks and stingrays. In 2006 "Crocodile Hunter" Steve Irwin was killed on the Great Barrier Reef when a stingray stabbed him in the heart. "We didn't take any chances," explained Peter MacIntyre, General Manager of Ripley's Aquarium. "We had divers in the water guarding Dan, and an ambulance with trained EMTs was standing by in case of emergency. Fortunately, everything went according to plan and we didn't need to use their services!" Meyer swallowed two different sized swords during the feat - a smaller sword first, followed by a longer 30-inch sword with 24-inch long blade. The viewing audience included local and national media, Bike Week tourists, and a class of students who were visiting the aquarium on a field trip. "I thought it was really cool because nobody else could do that," said student Miller Long. "When he swallowed the little one, I wasn't scared," said Hannah Ferguson. "But when he did the big one I was kind of scared!" Why would anyone want to attempt a feat this dangerous? "I've enjoyed performing stunts like sword swallowing for audiences around the world for several years." Meyer explains. "I also swam with sharks and stingrays when I lived on an island in the Bahamas for several years. So I knew I could do each of them separately. It just seemed natural to put the two challenges together," Meyer explained. "The big question was: Would I be able to do BOTH of them at the same time and survive? I'm glad to be able to stand here afterwards and say I did!" The feat makes Meyer the first person in America to ever swallow a sword underwater. "I'm so relieved everything went smoothly and without a problem. I'm especially excited to have made history with Ripley's Believe It or Not!" Meyer beamed with a smile. The feat is being considered for inclusion in the next edition of the Ripley's Believe It or Not! book and will be featured in a Ripley's Believe It or Not! cartoon in the popular cartoon series that runs daily in over 200 newspapers in 42 countries.